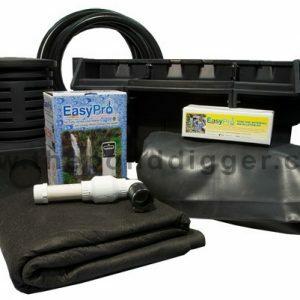 This is the preferred waterfall kit for most professional pond and waterfall contractors across American at this time! THESE WATERFALL KITS ARE EXTREMELY USER FRIENDLY FOR HOMEOWNERS AND FIRST TIME INSTALLERS! The waterfall spillway in this kit comes equipped with a tight fitting grate that makes it extremely easy to blend and hide your waterfall origin into the landscape. The waterfall pumps in these kits are Highly Efficient, are easy on your electrical bill, still offer longevity AND have fantastic flow rates that will easily handle taller and wider waterfalls! Included with this waterfal kit you will recieve killer quality plumbing supplies and a can of waterfall foam to maximize the look of your waterfall!